The border town of Lethem is illuminated this week as its second annual Town Week celebrations get underway. The week of activities started with an interfaith church service on Sunday and later that evening there was the official opening of the activity. There were also performances from an entourage parade, the Guyana Police Force and the Military Band. In his feature address, Attorney General and Minister of Legal Affairs, Basil Williams SC, noted that Lethem is an “emerging frontier for economic development”. “Lethem is being prepped by our government for modernisation and transformation, we within the government have a vision for this town. We see Lethem not as a rustic community, not as just a border town but as an emerging frontier of economic development particularly in the areas of agriculture trade and communication,” the Minister said. Williams noted that since Lethem is the capital of the largest region in Guyana and home to a unique range of biodiversity this reinforces the plan to erect a new pillar for sustainable economic development, nature and adventure-based tourism in the region. 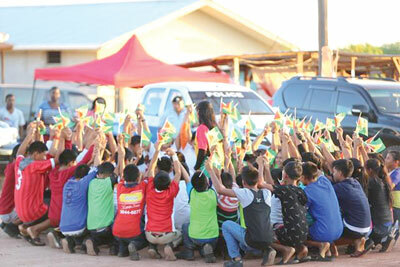 He said the observance of Lethem Town Week provides an opportunity to gauge progress and attract investment. In terms of infrastructural development, the Attorney General disclosed that there will be a new magistrate court, a business registration centre and a passport office constructed and more street lights will be installed. His remarks also centered on the developments that have taken place in Region Nine and particularly Lethem. Williams spoke of the prospects of Lethem becoming a hub for trade in South America and the Caribbean especially with the paving of the Linden to Lethem road. This, he said, will create many opportunities not only for the town but other communities along the route. Also addressing the event was Guyana’s Ambassador to Brazil, George Talbot, who noted that Lethem is ‘ground zero’ for relations with Brazil. He noted that ties between the two nations are strong and developing on many fronts. The Ambassador cited the recently hosted 22nd regional military intelligence meeting and the launch of the South Rupununi wells project. He also mentioned upcoming meetings to be held in Bonfim, Brazil, where several issues will be discussed, including the Linden/Lethem road. “…Brazil and Guyana are collaborating on the engineering design for the Mabura Hill to Lethem portion of that road. Right now, work is ongoing in the two capitals to finalise the terms of reference for that project, which will complement efforts that are being made to ensure the Linden to Lethem road is a reality. “I am very hopeful and confident that the road is no longer just a matter of dreams and wishes but a soon coming reality,” the Ambassador said. Meanwhile, speaking with the Department of Public Information, Mayor Kerry Jervis, said all the local accommodation facilities are fully booked and there are still more requests for such coming in. Town Week is an annual event which aims to showcase the unique offerings of Lethem and the overall diversity of the Rupununi. During this week patrons can expect a variety of activities including a Plant-a-Tree campaign, Talent Show, performances by local artistes, a boxing exhibition by Guyanese and Brazilians athletes and a series of football matches, a beauty pageant as well as a Regional Agricultural and Commercial Exhibition (RACE) to showcase the productivity and innovative products of the region. Mayor Jervis said the second Town Week promises to be better since the first served a learning experience, and certain aspects were tweaked or discontinued, with the intention of providing a better experience for patrons.